Marathon Nextown: Modern living spaces that provide value for money! 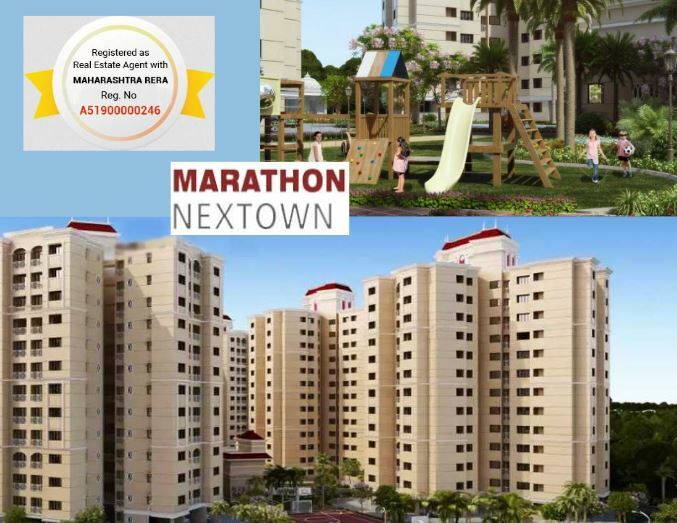 Marathon Nextown is an upcoming residential development by Marathon Group which is a trusted real estate development group from Mumbai. The project is a township development that consists of multiple towers which have been beautifully crafted into 1 BHK, 2 BHK, 2.5 BHK, and 3.5 BHK apartments filled with all luxuries that you can think of. The layouts have been planned well with smartly done interiors and the best fittings have been used by the developer. There are wide balconies and large windows with each apartment that lend a beautiful view as well as provide ample sunlight and ventilation. The gated complex consists of all the modern amenities that one can think of in their dream home. There is a well-equipped gymnasium within the complex. Sufficient open spaces allow the residents to relax and enjoy the abundant greens outside. The other highlights include a clubhouse for social gatherings, senior citizen’s corner and a multipurpose sports court for sports enthusiasts. There is a separate kids’ play area, a community hall and a temple within the complex. The residential project boasts of a cricket pitch as well as an amphitheatre. A separate jogging track and a walking trail have also been provided so you can relax among the calm greens. There is a provision for rainwater harvesting and a sewage treatment plant. The project is eco-friendly with solar powered street lights and a generator backup for all common areas. 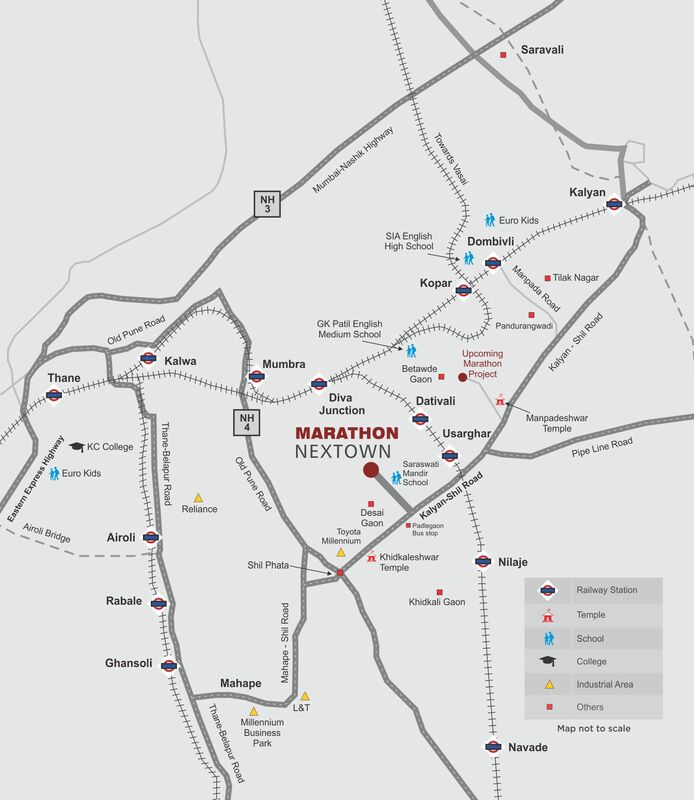 Marathon Nextown Navi Mumbai is strategically located off Kalyan-Shil Road, Thane East, Navi Mumbai. The location is easily accessible from neighbouring roads and highways. It is just 11 km from Dombivali Railway Station, 4 km from Diva Junction, and 6.3 km from Nilaje Railway Station. It has easy access to NH-3 Highway (Mumbai - Nasik Highway) and NH-4 (Mumbai - Pune Highway). A flyover has also been proposed for Dombivali - NH3 which will make commuting a breeze. Leading hospitals, shopping malls, and bus stops are all just a few minutes drive from the complex. Popular schools like Chandresh Lodha Memorial School, Saraswati Mandir School, GK Patil English Medium School, Euro Kids School, and KC College are well within easy reach of the residential apartments. Marathon Nextown price is available on request and the builder is offering attractive payment schemes for the buyers. Without doubt, Marathon Nextown offers magnificent modern living spaces that address the housing needs of Mumbai's growing populace.